In his latest book, Chef Jeff Henderson, the New York Times best-selling author of Cooked: From the Streets to the Stove, From Cocaine to Foie Gras, presents two decades of life lessons that he gained on his redemptive journey from drug dealer to TV celebrity chef to nationally acclaimed speaker. He has devoted himself to mentoring and motivating at-risk and vulnerable Americans, and his remarkable achievements and inspiring presentations have made him a sought-after speaker for business and non-profit organizations, addressing tens of thousands of individuals each year at conventions, conferences, and seminars. Now, with the 12 inspiring and pragmatic "recipes" he offers in this book, you can discover your hidden business aptitudes, make life-changing decisions, and secure bulletproof personal and professional success. 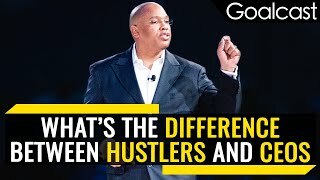 Whether you're a "have-not" suffering from generational or situational poverty or a "lost-a-lot" knocked out by the economic recession, you'll learn something from Chef Jeff's unique perspectives on the virtues of self-knowledge, hard work, determination, and leverage in the real world. Reboot your dreams and gain a new foothold on the ladder to success! By twenty-one, Jeff Henderson was making up to $35,000 a week cooking and selling crack cocaine. By twenty-four, he had been sentenced to nineteen and a half years in prison on federal drug trafficking charges. It was an all-too-familiar story for a young man raised on the streets of South Central LA. But what happened next wasn't. Once inside prison, Jeff Henderson worked his way up from dishwasher to chief prison cook, and when he was released in 1996, he had found his passion and his dream -- he would become a professional chef. Barely five years out of federal prison, he was on his way to becoming an executive chef, as well as being a sought-after public speaker on human potential and a dedicated mentor to at-risk youth. A window into the streets and the fast-paced kitchens of world-renowned restaurants, Cooked is a very human story with a powerful message of commitment, redemption, and change. From humble beginnings in South Central Los Angeles to imprisoned drug dealer, and now an award-winning celebrity chef and best-selling author, Chef Jeff is a role model for anyone who needs the encouragement to reinvent their lives. Since he discovered his passion and gift for cooking in the unlikeliest of places –prison –Jeff has completely turned his life around, and today serves as a popular and powerful voice for self-transformation. Jeff started his professional culinary career as a cook for Chef Robert Gadsby in Los Angeles. His first chef position was at the Coronado Island Marriott. He went on to work at Ritz-Carlton, Hotel Bel-Air and L'Ermitage (currently Viceroy L'Ermitage Beverly Hills). In 2000 Jeff left Los Angeles to take a chef position at Caesars Palace where he made history as the first African American Executive Chef. A few years later, he accepted a position at Bellagio and made history once again. Jeff is the creator and star of the Food Network's reality series, The Chef Jeff Project, former host of Family Style with Chef Jeff, and the star of Flip My Food. In his latest book If You Can See It You Can Be It (Smiley Books/Hay House), he reveals his hard-knock, yet transformative, life lessons to help others realize their potential, discover their hidden business aptitudes, make life-changing decisions, and gain a new foothold on the ladder to success. Jeff's story has been featured on Oprah's Life Class, Good Morning America, Today, CNN, ABC News, The Steve Harvey Show and in major publications such as USA Today, People Magazine, New York Times, Newsweek, the Washington Post, and many others. His life story is being turned into a feature film by Sony Pictures based on his New York Times Best-Selling memoir Cooked (HarperCollins). Jeff resides in Las Vegas with his wife Stacy and their five children. Using his compelling personal story as a backdrop and his signature no-holds-barred style, Jeff shares his best practices for self-knowledge and goal-setting. This presentation is designed to empower you to live your best life, get in the kitchen of endless opportunities and start cookin' your recipe for success-because If You Can See It, You Can Be It. Take the journey into the streets and fast-paced kitchens of world-renowned restaurants as you hear a powerful message of commitment, redemption, and change. From overcoming hardship to identifying one's talents, Henderson shares his hard-knock yet transformative life lessons and the secrets to rising above and realizing your full potential. Chef Jeff's is no ordinary keynote speaker, he delivers an inspirational talk and an unforgettable learning experience on LEADERSHIP, RESILIENCE AND TRANSFORMATIVE DECISION MAKING all while cooking pan seared "Foie Gras" or his signature "Wood Smoked Diver Scallops."